Zenergy Physical Therapy is a Unique Integrative Holistic Blend of Yoga, Pilates, Therapeutic Exercise , Manual Therapy , and Physical Therapy dedicated to Optimizing Rehabilitation, Recovery , Motion , Energy, and Wellness . for his clients. 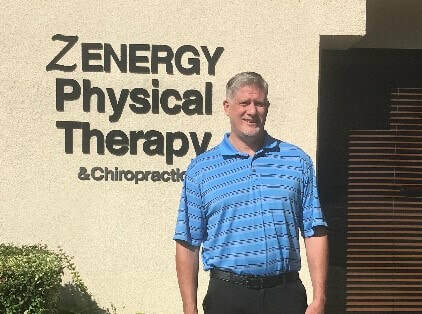 "Zenergy Physical Therapy is just a much more relaxing atmosphere and it's really, in my opinion, the way physical therapy should be. We have the time to spend with a patient one-on-one and really get to know the patient and try to achieve their goals." Jamie comes to Zenergy with an Executive Assistant background in the Biotechnical Industry, Healthcare , and Customer service. She is very knowledgeable and helps members with answering questions about classes, services available at Zenergy, questions about health insurance benefits, as well assisting with scheduling and coordinating patient appointments. She is very active individual, and volunteers regularly at the Del Mar Community Connections. Her outside interests includes running , cycling , yoga . She realizes the importance of of having a healthy lifestyle and feels that the Zenergy Physical Therapy Approach employs the best integrative whole systems perspective to rehabilitation and recovery. Rachel has over 19 years experience as a Physical Therapist all across the care continuum specializing in geriatric physical therapy in the acute, post-acute, home health, and out patient rehabilitation. She is very passionate about helping clients meet their goals and returning to their best level of functioning and reaches their personalized physical therapy goals. She has been a very strong Rehabilitation Director in multiple settings responsible for direct supervision and guidance of all therapy personnel, which includes physical therapists, occupational therapists, speech therapists, physical therapy and occupational therapy assistants, aides and rehab students in multiple facilities. She is a strong proponent of Holistic health being proactive and preventative to avoid unwanted negative outcomes. Her philosophy views the individual is viewed holistically and globally taking into account their entire lifestyle; physically, mentally, and sometimes spiritually is incorporated as she oversees the evaluations and treatment of the clients. ​Michael has 27 years in healthcare starting his career by becoming a certified nursing assistant through a regional occupation program. He then worked as nurse in many skilled nursing rehabilitation facilities, and then went on to earn his bachelor and master degrees in nursing and his master degree in business administration. His clinical background as the RN charge nurse and interim clinical supervisor for the largest and busiest emergency rooms in San Diego County, RN Case Manager of post surgical patients in the post acute rehabilitation setting, and primary care. In addition to assisting patients, he also serves as a teacher, preceptor, and mentor to nursing students. He is a passionate nurse, who takes a mind-body-spirit-emotion approach to the practice of traditional healthcare by employing alternative forms of medicine alongside traditional Western medicine approaches when it comes to rehabilitation. He advocates and often will encourage patients to integrate self-care, self-responsibility, and reflection into their lives so as to help maintain a proper balance of mind, body, and spirit. This passion for holistic health stems from a strong desire to shift the current focus of health care from disease management to a new healing holistic approach toward rehabilitation that is the philosophy of Zenergy.